The economic conflict with China is set to escalate as new US tariffs on as much as $200 billion of Chinese goods go into effect this week (Paletta and Lynch, Sep. 15, 2018). President Trump reportedly views the tariff conflict as a mechanism for forcing China to negotiate over a variety of issues of concern for American exporters(Lynch, Sep. 13, 2018). Agricultural markets have seen rapid drops in corn, sorghum and soybean prices as tariffs have become operational (farmdoc daily, July 31, 2018). The tariff has already affected quantities and values of US grain and oilseed exports (farmdoc daily, August 16, 2018). Of particular concern, however, is the long-run effect on US agricultural exports, particularly soybeans. In July 2018, Soybean prices in the U.S. fell to the lowest point in almost a decade, lowest since March 2009 (Parkin, July 2, 2018). In Illinois, soybean prices have declined $2.50 per bushel from a high of $10.34 to a low of $7.84 in the middle of July (farmdoc daily, August 16, 2018). The knock-on effect from weaker soybean prices also impacts other grain products. Corn prices have fluctuated over the last five months from a high of $3.78 per bushel down to a low of $3.09. The financial hit from a lower soybean price could push farmers away from soybeans and back toward traditional crops of choice, like corn and cotton (Patterson, July 9, 2018). The reason for the price drop is mixed. Soy futures have been in decline for years due to large harvests in Brazil and the U.S., the two largest producers. In the 2018 crop year, production of corn and soybeans in Argentina and Brazil is expected to increase by 17% and 13%, respectively (farmdoc daily, August 16, 2018). Figure 1 provides a comparison between U.S. and Brazilian soybean prices and it indicates that the Chinese tariff is having a negative impact on U.S. soybean prices. Since April 2018, the U.S. soybean price is on the decline while the Brazil price increases. Along with the low soybean price in the U.S. is a record $2 price spread (shown as the gray line in Figure 1), which is very close to the 25% price difference that would be predicted by the tariff. Soy prices are around $8.38 a bushel in the U.S. and over $10.50 per bushel in Brazil (Mano, Sep. 10, 2018). (Figure 1). 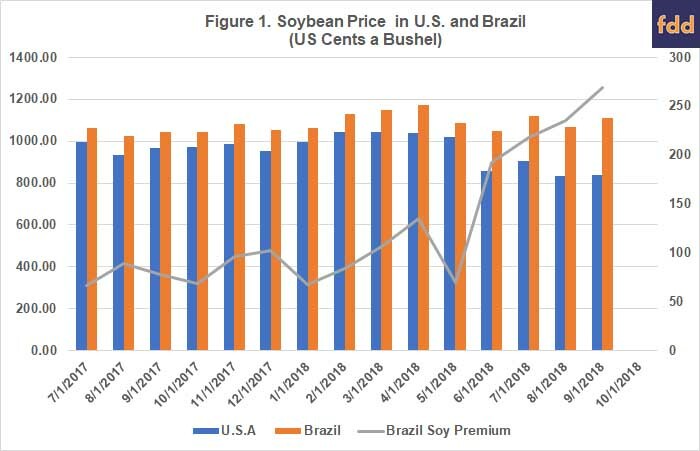 This price divergence between the worlds’ two largest soybean producers, U.S. and Brazil, reflects a potential shift in global agricultural trade flow. This premium suggests a growing possibility that China will become more dependent on Brazilian soybeans. Even with a rise in local prices and the planned subsidies from the government, China’s current domestic supply of soybeans will not be sufficient to cover their demand, (Parkin, July 2, 2018). 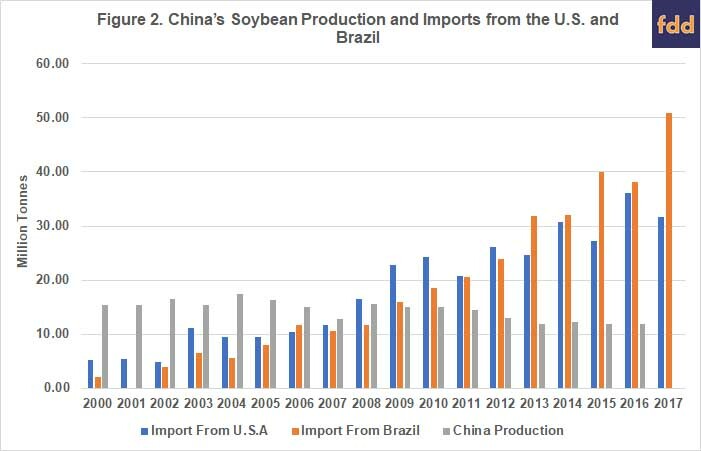 Figure 2 shows the decline in China’s soybean production and the increasing reliance on imports from the U.S. and Brazil. Instead, the tariff is likely to lead China to rely on alternative sources for soybeans, especially Brazil and Argentina. In 2017, Brazil exported 53.8 million tons of soy to China, about 75% of its total production. This year, China is expected to increase soybean imports from Brazil by approximately 90%, equivalent to around 66 million tons (Rapoza, Aug. 15, 2018). At this price premium, in the short run, Brazil and Argentina based exporters may buy from the U.S. and sell to the Chinese market. This might explain the increased soybean exports in recent months from the U.S. to Argentina. The largest agricultural companies in the U.S., Cargill, ADM, and Bunge all have subsidiaries in Brazil and are planning to do so (Rapoza, Aug. 15, 2018). With Brazil exporting more of its soy to China, EU, Japan, Mexico and the countries of Southeast Asia will likely focus their attention on buying from the U.S. instead. However, there is every reason to believe that they will not pay more than what the US can get from the Chinese market, which means a potential 25% price discount. There are reasons to believe that Brazil is likely to replace the U.S. as the world’s largest soybean producer and exporter with Brazil’s rapid development in soybean production in recent years. According to FAO statistics, Brazil more than doubled its acreage planted to soybeans, from a low of 13.6 million hectares in 2000 to a high of 33.2 million hectares in 2016. 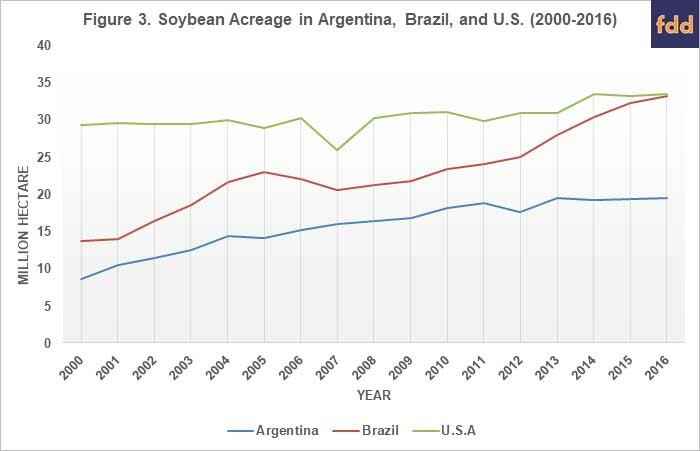 During the same time, the soybean acreage in the U.S. stayed around 30 million hectares, with an increase of 14% compared to Brazil’s increase of 143% (Figure 3). After adopting GMO soybeans, the yield in Brazil has increased to around three hectogrammes per hectare (hg/ha), close to the U.S.’s average of 3.5 hg/ha (Figure 4). Production in Argentina has also increased rapidly in recent years. In three to five years, Taheripour and Tyner (2018) estimate that the soybean production in Brazil would increase by 9%–15% while the U.S. soybean production would decrease by 11% -15%, with China’s tariff on U.S. soybeans in place. Existing evidence suggests that the restructured soybean trade after the trade conflicts will be in favor of Brazil and Argentina rather than the U.S. Michael Magdovitz, an analyst at Rabobank, believes China might need to import 15m to 20m tons from the US over the next six months, representing a fall of 5m to 10m tons from the same period a year earlier. The tariff could drop China’s imports of soybeans by 69 percent on average (Hassan, August 15, 2018). The estimated effect of China’s 25% tariff on U.S. soybean imports would cut income for a midsize Illinois grain farm by an average of 87% over four years, prompting a loss of more than $500,000 in the farm’s net worth by 2021 (farmdoc daily, April 17, 2018). Taheripour and Tyner (2018) use Global Trade Analysis Project-Biofuels (GTAP-BIO), a well-known global economic model, to evaluate the global economic impacts of Chinese tariffs on their imports of U.S. soybeans, corn, wheat, sorghum, and beef. The model analyzes production, consumption, and trade of all goods and services at the global scale by country. By simulating a 25% increase in Chinese tariff on U.S. soybean, corn, wheat, sorghum, and beef imports, the model produces medium and long-run impacts on the global economy. Their result shows the 25% tariff proves to be a lose-lose proposition for both China and the United States. Brazil benefits from the policy both in the soybean industry and its entire economy. According to the simulated results, Chinese soybeans imports from the U.S. will drop more than 48%, while imports from Brazil will increase 18%-36%. As a result, soybean production in the U.S. will decline by 11%-15%, while increasing 9%-15% in Brazil. The economic welfare in the U.S. is predicted to fall by $2.2–$2.9 billion annually, with Brazil increasing by $1.5–$2.8 billion per year. The Chinese economy will fall by $1.7-$3.4 billion every year, contributing to a loss in global welfare loss of $1.2 to $1.8 billion. Trade wars in the form of tariffs and tariff retaliation can escalate quickly with widespread, long-term damage, particularly for firms with increasingly complex international supply chains (farmdoc daily, August 29, 2018). For America’s farmers, the escalating conflict with China is providing a case study in real time. The initial economic consequences of this dispute with China can be seen in recent soybean prices; the long-term consequences are harder to understand and potentially more problematic. The initial responses are concerning as the trade shocks generated by the current US-China trade war is already leading to trade diversion, benefiting other soybean suppliers on the global market, such as Brazil and Argentina. 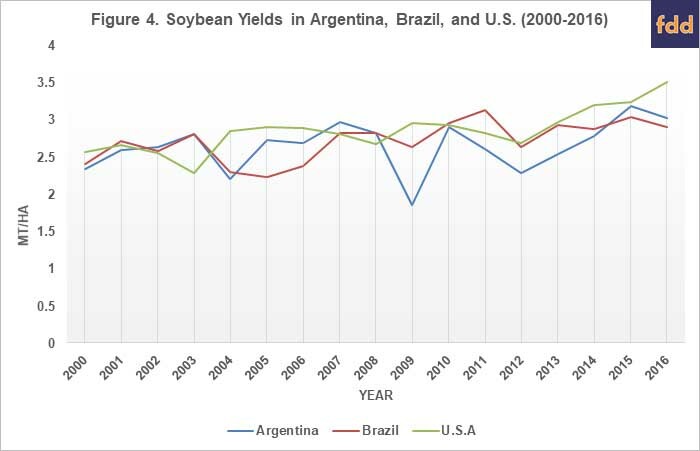 Given Brazil and Argentina’s rapid expansion of their soybean sectors, US soybean producers are right to worry whether this short-term shift in trade patterns might establish itself in the long run, to the detriment of our soybean industry. Swanson, K., J. Coppess, and G. Schnitkey. “Trade Timeline and Corn and Soybean Prices.” farmdoc daily (8):141, Department of Agricultural and Consumer Economics, the University of Illinois at Urbana-Champaign, July 31, 2018. Swanson, K., G. Schnitkey, T. Hubbs, J. Coppess, N. Paulson and C. Zulauf. “Impacts of Chinese Soybean Tariffs on Financial Position of Central Illinois Grain Farms.” farmdoc daily (8):68, Department of Agricultural and Consumer Economics, University of Illinois at Urbana-Champaign, April 17, 2018. Zhou, Y., K. Baylis, J. Coppess and Q. Xie. “Dispatches from the Trade Wars.” farmdoc daily (8):162, Department of Agricultural and Consumer Economics, University of Illinois at Urbana-Champaign, August 29, 2018. Zulauf, C., J. Coppess, N. Paulson, and G. Schnitkey. “The Tariff Conflict and Change in Value of Production of U.S. Field Crops.” farmdoc daily (8):153, Department of Agricultural and Consumer Economics, the University of Illinois at Urbana-Champaign, August 16, 2018.